Audio and personal photos from Kay's diary entries and interviews. Read a longer version of this story produced for the BBC. Has terrorism violated your trust in others, or impacted your personal relationships? What's your opinion? Send us your commentary. 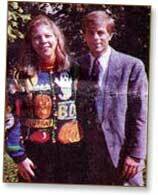 Kay Fulton lost her brother, Paul Ice, in the Oklahoma City bombing in April 1995. After Timothy McVeigh was sentenced to death for setting the bomb, she volunteered to witness the execution, convinced that her brother's murderer should feel the "split second of down to your toes fear" that only the death penaltynot life in prisoncan deliver. Fulton's diary describes the execution and her feeling of relief watching McVeigh take "his last puff of air." Afterward, she declares herself ready to resume a normal life. 9/11, though, jolts Fulton. She flies to New York to counsel those who lost relatives in the attacks. She records dinner conversations with New York families outraged by the media-hyped controversy over the compensation fund and later, spends time with many of the New Yorkers who go to Oklahoma City for the 7th anniversary of the bombing. Kay Fulton began this intimate diary of a sister who loses a brother to terrorism in the weeks leading up to the execution.